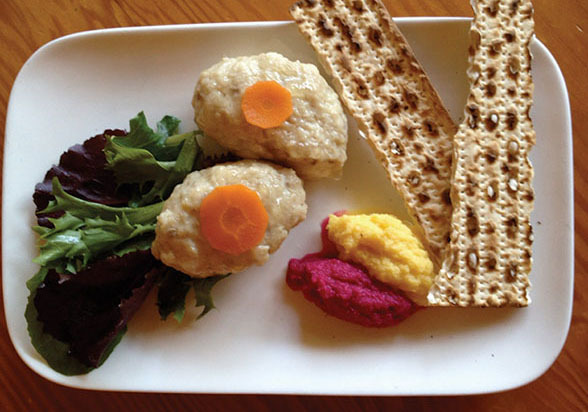 4 families' Passover foods from Iran, Iraq, Latvia — and the East Bay – J. If there are dishes more closely associated with Ashkenazi Passover cooking than matzah ball soup and gefilte fish, we can’t think of them. But as Jews around the world begin their Passover preparations, diving into spring cleaning, planning menus and perhaps even cooking the chicken soup in advance and freezing it (shhh … we won’t tell), we set out to find local seders where these iconic dishes are not highlights of the menu, and sometimes not on the menu at all. Instead, the foods celebrate the families’ unique histories and carry on traditions from their native countries, or in one case, reflect the values of the hosts. Sima Canoush, born in Baghdad, came to San Francisco in 1971 after spending her formative years in Israel. Family seders are now held at her daughter’s house in Olympia, Washington, and Ashkenazi fare such as matzah balls has been introduced. But one thing that remains essential is her Iraqi haroset. In the old days, dates were simmered in hot water and then pressed through cheesecloth to make a liquid; walnuts were put into a sack and broken down with a hammer. But now, it’s possible to buy silan, or date syrup, and walnuts can be chopped in a food processor. The syrup is combined with enough ground walnuts to make a paste (and truth be told, it is more suggestive of mortar than the Ashkenazi variety made with apples). Adding a touch of lemon juice helps balance the flavors and makes it a tad less sweet. Canoush grew up eating either fried fish or fish soup for Passover, though she doesn’t make those foods now. But one dish she often does make is her version of shufta, a dish that is somewhere between a soup and stew, with meatballs and rice. Canoush’s daughter-in-law is mostly Ashkenazi but is carrying on the tradition of making shufta, and Canoush proudly reports that her grandson loves it. Sima is not one to use recipes much, but she explained how to make shufta this way. Vegetable amounts are an estimate. Mix beef, diced onion, pepper, salt and baharat. Shape into elongated meatballs. To make the soup, grate an onion and a few tomatoes. Cook them together with some salt and pepper until they start to break down. Put the meatballs in the pot with the onion and tomato mixture. Let them cook on all sides, moving them around so they don’t burn. Add a bit of water to unify sauce. Add pieces of diced yellow squash and diced carrots and peas into soup along with more baharat. To serve, pour over rice or a starch of your choice. Pulse walnuts in a food processor until ground into small pieces. Scrape them into a bowl. Add date syrup and mix until consistent. Add lemon juice to taste. 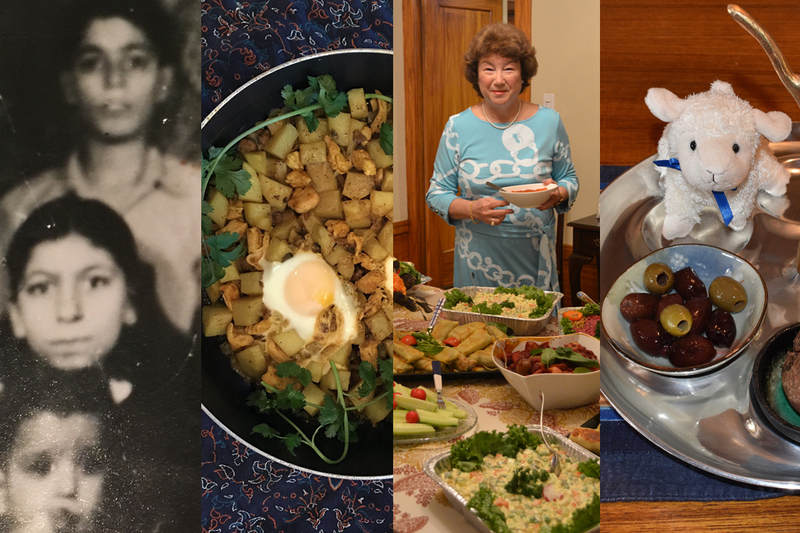 Jilla Ehsanipour is marking her 40th anniversary of living in the U.S., but the foods on her seder table still represent her native Tehran. She recalled as a child the excitement of pulling out the boxes of special tablecloths and dishes used only during Passover, and how everything was pristine since it was only used once a year. The Burlingame resident left Iran at the time of the 1979 revolution, married another Persian Jew and had two daughters who are now adults. 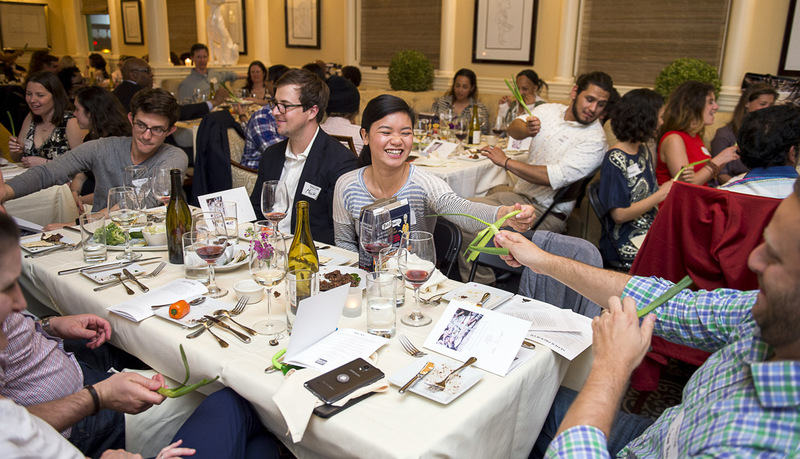 Today, the singing of “Dayenu” at the Ehsanipour home is definitely the highlight of the seder, as it is in many Persian Jewish homes, as guests hit each other with scallions to represent the whipping of the slaves by Pharaoh. It escalates from there. “When there are a bunch of people young and old, with lots of cousins, we start with the green onions, but then we move to shoes and belts,” she said, stressing that they only pretend they’ll strike each other with these items. For years, one of the most iconic Passover foods has been absent from the Ehsanipour table. The most common chicken soup in Persian Jewish homes is made with rice, not matzah balls. But Ehsanipour said the family has adopted some American Jewish customs and matzah balls may make an appearance this year. Rather than gefilte fish, Ehsanipour makes fish with saffron. The main dish is often chicken stew with vegetables and rice. Perhaps most popular on her Passover table, though, is a stew with no name. “I make it every year. You can call it whatever you want,” she said. The stew can be made vegetarian, but it normally contains chicken or beef. The meat is browned with onions and then sautéed with other vegetables like mushrooms, bell peppers and potatoes with some turmeric. Then eggs are broken on top and left to set. “You can serve it with rice, eat it with matzah or just plain, because it has everything in it,” she said. Like Sima, Jilla is not one for amounts in recipes, but this is her estimation of how to make her stew. In a large pan, spray olive oil. Chop onion and fry slightly. Cut chicken into bite-size pieces and add to the onion. Cut potatoes into bite-size squares and add to the pan. If you like bell pepper and/or mushroom, cut and add them with the rest. Mix everything and add salt, pepper and turmeric. Fry all in medium heat 2 minutes. Add ½ cup of water and cook covered on low heat until fully cooked. This dish can be served over white Persian rice or as a sandwich with matzah. As a child, Nemchenok looked forward to Passover, not only because of the fresh smells in the house — she can still recall the smell of the special floor wax her mother used — but because it was the one time of year she could count on getting a new outfit. She remembers the older men reclining on pillows and wearing big hats. While traditional Ashkenazi food was the norm in her family, there were some deviations. The first course would be the traditional dishes found on many Russian tables, including numerous kinds of herring, pickled vegetables and meats. The seder always concluded with a compote made from dried fruit, which Nemchenok loved because it was a light touch after such a heavy meal. Sometimes, the remaining liquid from the compote was added to bubbly water to make a homemade fruit-flavored soda, which was especially popular among the kids. In her childhood home, the second night of Passover had a sweet-and-sour theme, with dishes favored by the Jews of Riga. Sweet-and-sour fish replaced the gefilte and a sweet-and-sour borscht with matzah balls replaced the chicken soup. Nemchenok continues to make the sweet-and-sour fish to this day, often using salmon or whatever appeals to her. “It’s an easy dish that you can make two or three days before,” she said. Stuffed prunes are another sweet dish she remembers. After the prune was pitted, it was stuffed with ground walnuts. Sour cream mixed with sugar and lemon zest was drizzled over it. “That was also a very tasty, very light thing we ate on Passover,” she said. This traditional Latvian Jewish dish for the second day of Passover should be refrigerated for 24 hours to allow the delicate sauce to flavor the fish. Keeps up to 4 days under refrigeration; do not freeze. In a lidded pot wide enough to hold all fish, put carrots and onions. Reserve some onions and carrots for later. Add enough water plus a little more (some will evaporate) so that it will cover the fish once placed. Add salt, pepper and sugar. Bring to boil. Lower the heat and gently add the fish to the pot. Add the rest of the onions and carrots on top. Cook fish with the lid open on medium heat. After 30 minutes, add pickling spice, vinegar and bay leaves. Cook for another 30 minutes. Taste the sauce and add extra vinegar or sugar to taste. It should be equally sweet and sour. Turn off the heat. When fish cools down, refrigerate the whole pot. Serve fish with some of the carrots on a large platter the next day. Use a little cooking sauce when plating the fish. Daniella Salzman of Oakland is hosting a vegan, gluten-free seder with her mother for the second year in a row. Salzman, a vegetarian for nearly half her life, was vegan for a brief period. But seeing two documentaries, “What the Health” and “Cowspiracy,” convinced her to return to veganism. “After watching the movies, I realized that in order to really walk my talk and live with more integrity, I needed to stop eating all animal products,” the single most effective thing one can do to fight climate change, she said. 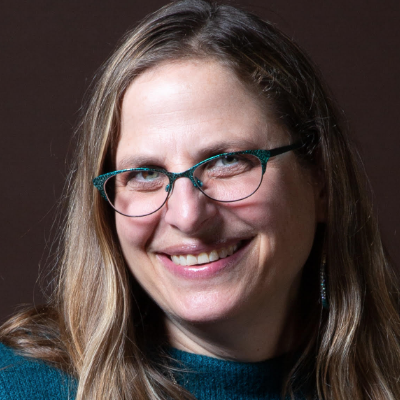 At the seder, Salzman and her mother, Elana Levy, a longtime social activist, use a haggadah that focuses on liberation for all peoples and is based on the Freedom Seder instituted in 1969 during the civil rights era. In addition to sharing the understanding that animals should be just as free as humans, they also discuss how “Mother Earth is being oppressed by our species and people around the world are suffering from the wars that we as a country are supporting militarily,” said Salzman. A roasted beet and a small stuffed-animal lamb represent the shank bone on the seder plate. A main course might be Salzman’s matzah lasagna made with her own homemade marinara sauce, macadamia nut ricotta, béchamel sauce and lots of veggies, and her gluten-free matzah balls served in a homemade vegetarian broth. In a mixing bowl, place matzah ball mix or combine matzah meal (if using) with salt and pepper. Put tofu in food processor or blender with broth and blend until smooth. Add oil and blend again. Mix tofu mixture with matzah ball mix or meal; then add grated carrot until it’s well combined. Cover and refrigerate for 1 hour up to overnight. Bring 1 large pot or 2 medium pots of water to a boil (you don’t want to crowd the pot), then add salt generously. Form tablespoon-size matzah balls and place on plate. When done, add to boiling water one at a time. Keep at a low simmer. When all the balls are in the pot, cover and do not remove the lid until 40 minutes later. After 40 minutes, lift the lid and immediately remove the balls from the water and let them cool to solidify. Place balls in serving bowls topped with soup and fresh dill. Note: If you don’t make your own broth, I recommend organic veggie bouillon or Better Than Bouillon. For the Homemade Broth: Fry 1 chopped onion in 1 Tbs. olive oil. Chop and add 2 carrots, 2 parsnips, 2 leeks, 3 cloves garlic, lots of parsley and dill, 1 tsp. salt, and 10 cups water. Boil then simmer partially covered for 1 hour and strain. For the Soup: Fry 1 chopped onion in 3 Tbs. olive oil. Add 4 sticks chopped celery, 4 chopped carrots, lots of chopped dill and parsley. Add 10 cups veggie broth (homemade or use prepared bouillon). Cook about ½ hour.